Loft Conversions completed by A.D.C. House Styles Ltd.
Our specialist staircases are imported from Italy and are of the highest quality hardwood. Spiral Staircases or space saver stairs are sometimes the most efficient way to access the loft space without taking to much room in either the access point or the actual loft itself. 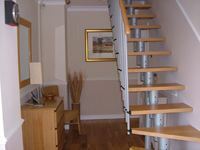 Manufactured staircases are a good option for those with the luxury of more floor space.